Press CTRL + D to add the file called frmOldies.vb from the above folder into your project (or right click on the project and choose to add it as an existing item). 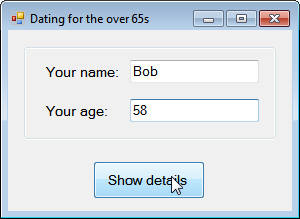 When someone clicks on the button shown, they should see their name, age and status (see below for how this is calculated) displayed back to them. What you might see after two people at opposite ends of life have typed in their details. Is the idea of an online dating agency for senior citizens a viable one?